I got very exited recently when I saw this makeup kit at Target. 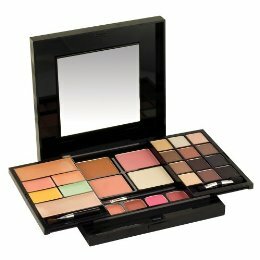 So often this kits are full of unwearable colors and random "creams" that do nothing for your face (is it a blush? a gloss? who knows?). But the Jemma Kid Backstage Kit is truly filled with fab neutrals, wearable blushes and even several creamy concealers. ﻿I was especially impressed with the fact that the concealers were in yellow (to cover dark circles) and green (to hide redness). You can tell that the kit was created by a makeup artist. At $35.00 it is a steal, and it would make the perfect Christmas present for that friend who you have been trying to get wear more than just chapstick for years. The Perfect kit for creating all of the smokey-eyed looks seen at Fashion Week!